Let the audience decide when to switch the image, as opposed to a non-stop timeline loop. In this tutorial, we are going to create a simple four photo carousel. Get the images used for the above campaign in this zip file, or set your own images. 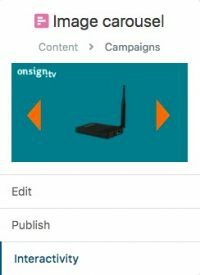 In your OnSign TV account, create a Campaign. Fill out the basic info, such as name and category. A carousel slides consists of three basic elements: a central photo frame and two buttons to go back and forth in the pictures. 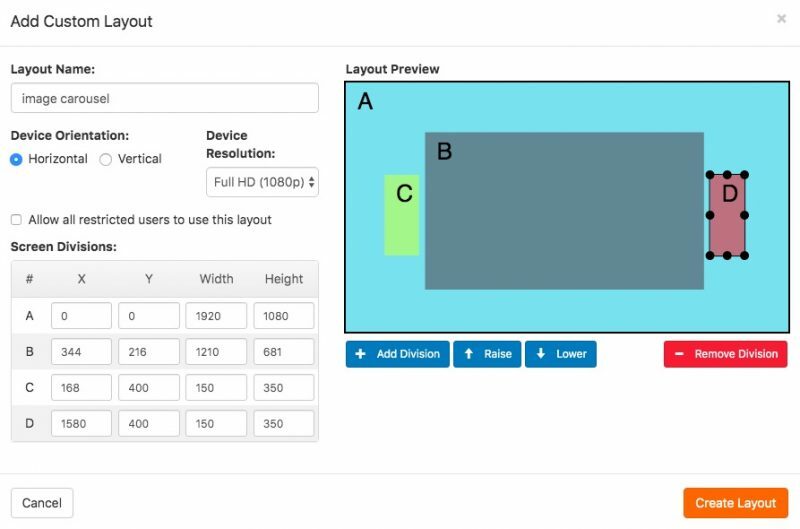 Hence, click on “Add Custom Layout” and create a zone for each of those. We have also created a screen zone for the background image. Upload to your OnSign TV platform the images you are going to use in this specific Campaign. In your Timeine, place the buttons in their respective screen zone, place the image background and a single photo of the carousel. Don’t place more than one photo in the carousel frame, or else it won't obey the button commands we will set later, instead playing non-stop on loop. Publish the Campaign to a Player. When you reach the “Published to these Players” page, select “Interactivity” on the left menu below the Campaign thumbnail. Now we are going to add interactivity to our carousel slider! Before setting actions, decide on the carousel photo sequence. We have used the following sequence to the pictures available in the zip file: IAdea.png > j22.png > minix x5.png > minix x7.png > IAdea > j22 (...) etc. With the sequence set, we need to set an action to both buttons around each photo. It is important that one action only happens to a specific photo, so we need to apply filters to each action. Which one: Region 4, which is the “next button”. In the row below, we are going to set a filter so it only changes to the next photo of the sequence (j22.png) when the specific photo is on screen. Thus, only when “IAdea.png” is shown, the next button action will change it to “j22.png”. Apply actions to all following buttons with the right filters. This is going to be a little bit of effort, but it's worth it. Don't forget the back button! Click on “Save changes” when you are done and test the campaign on your player!